All eyes were on LG as the technology company took the stage at the Sant Jordi Club in Barcelona, Spain, hours before South Korean rival Samsung to unveil its flagship smartphone for 2016, the LG G5. We had a pretty good idea of what to expect thanks to a series of leaks and thankfully, LG didn't disappoint. The LG G5 features a 5.3-inch Quad HD IPS Quantum display (2,560 x 1,440 / 554 PPI) that's powered by Qualcomm's Snapdragon 820 processor and Adreno 530 graphics alongside a hearty 4GB of RAM – all packed inside a full-metal unibody design. LG introduced an always-on display with its LG V10 smartphone. With the LG G5, they're taking it a step further by integrating the always-on function into the main display by selectively backlighting only a small part of the overall display. This affords the benefits of an always-on display without the need for a goofy secondary display; it consumes just 0.8 percent battery life per hour. The LG G5 is offered with 32GB of local storage (expandable to up to 2TB via microSD card slot) and features a 16-megapixel rear-facing camera, an 8-megapixel wide-angle camera, an 8-megapixel front-facing shooter and a removable 2,800mAh battery. The primary rear camera captures images using a 78-degree lens and is flanked by a 135-degree wide-angle shooter which LG says is the widest available in any smartphone. Connectivity-wise, the LG G5 features 802.11 a/b/g/n/ac Wi-Fi, Bluetooth 4.2, NFC, an X12 LTE modem and has a USB Type-C connector. It'll ship with Android 6.0 Marshmallow, we're told. As impressive as the LG G5 is on its own, what really makes the handset stand out is its modular design and ecosystem of peripherals. The LG Friends, as they're collectively called, are modular components that deliver added functionality to the LG G5. The bottom section of the handset slides out, allowing you to quickly replace the battery and / or swap in an alternative module. The CAM Plus module adds a camera grip as well as physical buttons for power, shutter, record and zoom, allowing you to shoot with one hand should you so desire. The CAM Plus also offers autofocus and exposure locks and includes a 1,200mAh battery of its own, booting the handset's total battery capacity to 4,000mAh on-the-fly. The Hi-Fi Plus with B&O Play is a digital-to-analog converter (DAC) that was developed in collaboration with Bang & Olufsen. It supports 32-bit, 384Khz high-definition audio playback either as a module for the LG G5 or as a standalone DAC for use with any smartphone or PC. To say it was a busy day for the South Korean technology company would certainly be an understatement as LG also showcased a series of non-modular accessories including the LG 360 VR headset, the LG 360 CAM, the LG Rolling Bot, the LG Tone Platinum Bluetooth headset and H3 by B&O PLAY earphones. 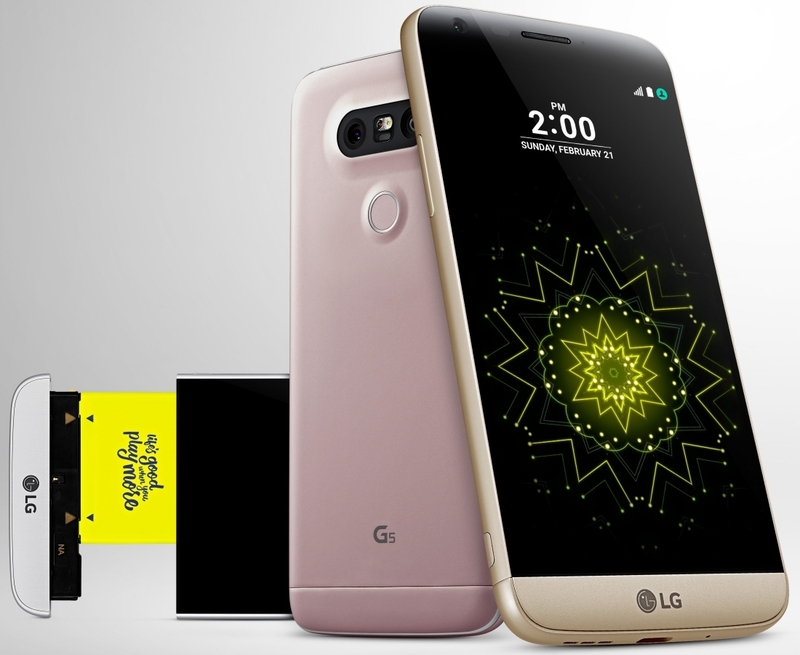 The LG G5 will be offered in silver, gold, pink and titan color schemes when it goes on sale globally early next month (AT&T has already committed to carrying it). No word yet on pricing.